Labour is set to back Theresa May’s Brexit deal, according to the party’s Shadow Foreign Secretary. Emily Thornberry says the deal will probably pass the party’s “six tests”. Her comments confirm Business Insider’s story from Monday. BI revealed private comments by Labour’s International Trade Secretary in which he suggested Labour would not risk voting down May’s deal. LONDON – The Labour party is set to back Theresa May’s final Brexit deal rather than risk crashing out of the EU without a deal, the party’s Shadow Foreign Secretary has admitted. Emily Thornberry told a Chatham House event on Wednesday that May’s deal would probably pass the “six tests” the party has set for supporting a deal. 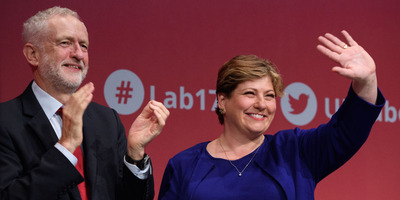 “If past evidence of the last few months is anything to go on, it’s going to be a ‘blah, blah, blah divorce, it’s not going to actually make any decisions, it’s going to continue to kick things down the road,'” Thornberry said. Thornberry’s comments suggest that Labour is now highly likely to back May’s Brexit deal in October, rather than risk crashing out of the EU without a deal. It means that May’s deal should pass easily in the autumn, even if she suffers a significant rebellion from her own backbenches. Her comments also confirm Business Insider’s story on Monday, in which we revealed comments made by the Shadow International Trade Secretary Barry Gardiner, in which he suggested that the party would back May’s deal regardless of what it contained. “Let’s look at the consequence of there being no deal. The UK will crash out of the EU,” Barry Gardiner said at an invite-only event in Brussels. Labour declined to comment on BI’s story prior to publication. However, it was later labelled “mendacious” by Gardiner, who used his Twitter account to accuse BI of taking his comments out of context. A spokesperson for Thornberry told Business Insider that the party would still be looking for “substantive answers” on whether May’s deal will pass their six tests. “Emily made clear, as we have done for more than a year now, that the government needs to deliver a deal which meets our six tests, in particular by explaining how we will maintain current arrangements on the Northern Ireland border, and ensure all UK firms maintain the current benefits of access to the Single Market and Customs Union. We await to see if we will get any substantive answers on those questions by the time of the planned vote in October,” the spokesperson said.